As I promised in the previous post, here is the butter biscuits recipe. I had tried other recipes before, but this is the one I follow because it’s the one that has given me the best results. I got my inspiration from Bea’s biscuits recipe (www.el rincón de Bea.com). Try it out! It isn’t that difficult as it may look like. 2) >> in a mixing bowl. 3) >> in a separated bowl. 5) Add + in the previous mixture and slowly for a few seconds. 6) Add , 1 spoon at a time, without stop (slow speed) –> We’ll get a crumbly texture. 8) Add and keep for a few seconds –> We’ll get a smooth dough. 9) the dough onto a flat surface covered with baking paper until you get a 0.2″ thick dough (0.2″ = 0.5 cm). Keep in mind that the top of the biscuit should be the straighter, the better. 10) Once rolled, keep 3 hours inside the fridge (at least). 11) Cover a with baking paper. 12) Cut the dough with the and place the biscuits onto the . 13) Put the baking tray with the biscuits inside the fridge for 15 min more (this will help to keep the shapes better). 14) Bake them for 10-12 min (until the biscuits borders are brown). 15) Leave the biscuits on the for 10 minutes. 16) Place them onto a cooling stand and leave them to cool completely before decorating (about 2 hours). 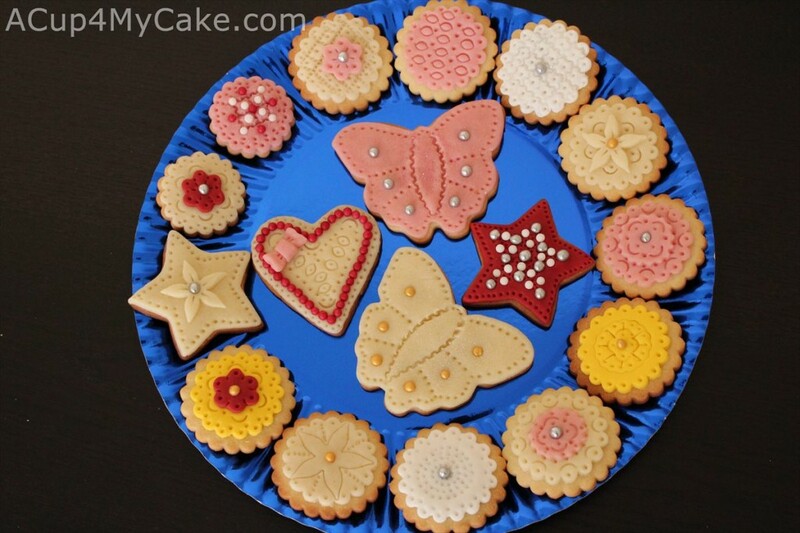 Once the biscuits are cooled, you can decorate them with sugarpaste, marzipan, chocolate, royal icing… In following posts, I’ll explain how to make home-made royal icing, as well as how to apply it onto the biscuits. ♠ Buy them at any supermarket, ready to roll. ♠ Colour them with any food colouring (always gel or paste, not liquid). ♠ Roll out them with a non-stick rolling pin. You should add some icing sugar onto the work surface to prevent from sticking. 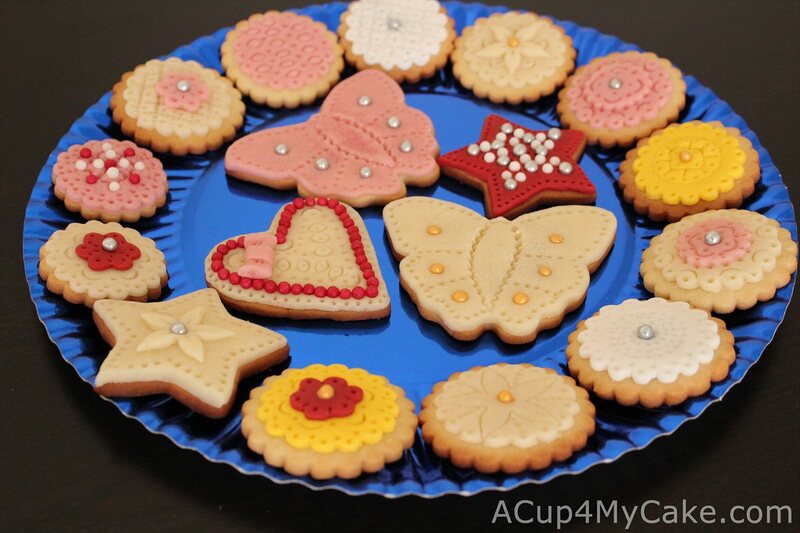 ♠ Use the same pastry cutters in order to cut the shapes and fit them onto the biscuits perfectly. ♠ Stick them onto the biscuits by using a paintbrush and golden syrup, edible glue… (something sweet and very sticky). ♠ Use several modelling tools to enhance the icing surface. ♠ Add some details (sugar balls, sprinkles, smaller shapes…). Decorated biscuits can be preserved inside a tin, jar or cellophane bags for a long time (several weeks). Good luck with your biscuits session! This entry was posted in Biscuits, Cookies, Recipes.